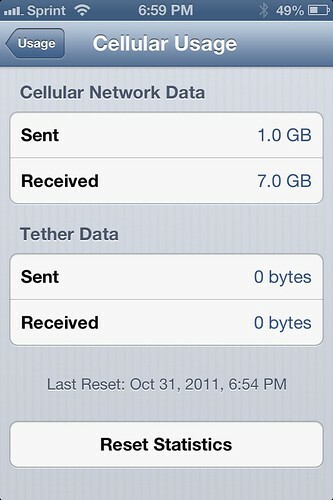 One year of cellular data - Step 2 is the hard part. 7 GB down and 1 GB up; 8 GB total; that averages to 666 MB per month. Clearly I’m not a heavy cellular data user and not making the most out of Sprint’s unlimited data allotment; this would fit comfortably within the other carriers’ smallest real2 data plans (1GB/month). Speaking of unlimited data plans: this might sound heretical to some, but I really wouldn’t mind metered data at a fair price. Say a penny a megabyte, billing you only for what you use. That comes out to $10 per gigabyte, which is actually the marginal rate that AT&T and Verizon are charging now anyway, except first they make you pay a minimum $30/month commitment and then they round up to the next gigabyte. Of course, I also wouldn’t mind an unlimited plan that was cheap and fast and allowed tethering3. In the meantime, here in the US we have Sprint offering unlimited data at a price that’s fair for heavy users but not especially cheap for light users, and their network isn’t the fastest and they have surcharge for tethering. Then we have AT&T and Verizon saying unlimited plans don’t incent them to invest in their networks so they’ve moved to metered plans; on the plus side their networks have gotten markedly faster and they don’t charge extra for tethering on the metered plans; however their metering methods don’t meet my definition of fair.